Even more than the average film festival, Toronto is absurdly front-loaded. So many high-profile movies screen simultaneously at the outset that even a site like The Dissolve, which had three writers watching up to five or six films apiece per day, wound up overlooking some major titles. By the final weekend, however, the pickings get slim, which is why a sizable percentage of the press corps—including Scott and Noel—have already headed home. I’m an inveterate TIFF straggler, myself, mostly because I’ve made a number of worthwhile discoveries over the years by hanging around. The relative quiet provides opportunities to investigate smaller, less heralded pictures, as well as behemoths that are otherwise tough to schedule. Take The Strange Little Cat, for example. Running a mere 72 minutes, it’s a whimsical wisp of a movie, reportedly devised by German director Ramon Zürcher for a filmmaking seminar conducted by Hungary’s retired giant, Béla Tarr. Apart from a few brief interludes that fall midway between reverie and flashback, the action is confined to a single cramped apartment, and there isn’t a story so much as a series of complex interactions between people, objects, and the titular cat (which is strange only insofar as every cat is inherently inexplicable). Yet it’s perhaps the most purely beguiling movie at this year’s festival—the rare film that offers a new way of looking at the everyday world. Zürcher’s sensibility has been compared to that of Jacques Tati, with whom he shares a puckish sense of humor predicated on small bits of business that expand into running gags. But his asymmetrical compositions and discordant juxtapositions, which employ visual and aural misdirection to make the familiar seem fresh and wondrous, are entirely his own. That probably sounds a tad abstract, so let me give you a concrete example. Very early on, Zürcher shows us the cat, pawing at a closed bedroom door, eager to get inside. A sound that at first seems as if it’s probably the cat’s mewl of annoyance is heard, though it’s hard to tell, as the cat’s mouth isn’t visible. The film then cuts to an adult woman looking down at something we can’t see, with an amused expression. Only then does Zürcher cut to the source of the sound, which is actually a young girl of maybe six or seven, yelling “Aahhhhhh!” for no apparent reason. And it only emerges over the course of the next 20 minutes or so that this is something the girl does in response to pretty much any loud noise she hears, from the garbage disposal to the whirring blades of a toy helicopter. 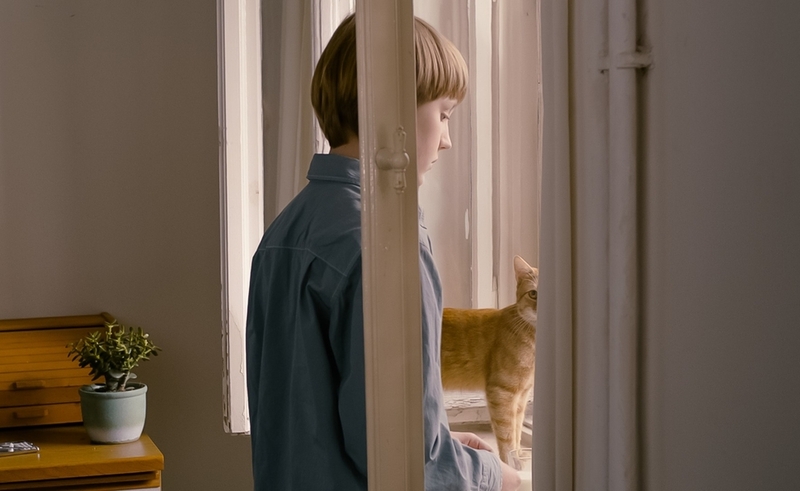 In a typical Sundance-friendly movie, such details would be random, “quirky” distractions from the narrative; in The Strange Little Cat, they are the narrative, especially in the way that they collide and build upon each other as various family members enter and exit various rooms in the apartment. The entire movie is one long, bravura orchestration of domestic chaos, somehow at once organic and mechanical, tinged with both joy and melancholy. If this is what Zürcher can concoct as, essentially, a class assignment, I can’t wait to see what comes next. The classroom itself is the focus of At Berkeley, the latest institutional portrait by documentary legend Frederick Wiseman. (At over four hours, it’s exactly the kind of film favored by us stragglers—last week, seeing it would have meant sacrificing at least two other big films, maybe three.) Though Wiseman made the classic High School way back in 1968, this isn’t a generic sequel that might as well have been called College; taking his fly-on-the-wall camera into lecture halls and chancellor’s meetings, Wiseman painstakingly creates a view of UC Berkeley that’s specific to its history as a hotbed of student activism. Because he does strive for balance, the first couple of hours, which are heavy on lectures, make At Berkeley veer perilously close to becoming TED Talks: The Movie. But nobody is better than Wiseman at depicting the machinery of large organizations in motion, and it’s in behind-the-scenes discussions of tuition hikes, global recruiting strategies, and preparation for inevitable demonstrations that the film continually fascinates. When students finally do hoist signs and banners and take over a library reading room, it’ll be up to the individual viewer to decide whether they’re heirs to Mario Savio or grandstanding whiners, and whether the Berkeley administration’s response to their demands demonstrates compassion or condescension. As usual, Wiseman editorializes only in the subtlest and least intrusive of ways, by how he shapes his copious footage. “Subtlest” and “least intrusive” aren’t concepts that apply to James Franco’s dismal adaptation of Cormac McCarthy’s 1973 novel Child Of God, for which I drew the short straw by sticking around. (So much for that thesis.) I’ll go ahead and predict that Franco, whose efforts to be this century’s Renaissance Man makes him seem a bit pretentious at the moment (another film playing at TIFF, Palo Alto, was adapted from his book of short stories), will one day prove himself a talented film director. But step one along that path is to give up trying to make movies from novels in which greatness can’t be divorced from syntax. Like Faulkner’s As I Lay Dying, the Franco version of which premiered at Cannes earlier this year, Child Of God enthralls entirely due to its author’s unique voice—its slim narrative, about a deeply antisocial misfit (played here by newcomer Scott Haze) who gradually becomes a serial killer, necrophiliac, and cave dweller, offers little of interest that can be externalized and photographed, unless one is fascinated by ranting and gibbering. Franco seems to recognize this to some degree, as he throws McCarthy’s prose on the screen and incorporates some of the narrators from the book’s first section, but he also seems to realize that such dogged faithfulness won’t cut it, as those devices entirely disappear before long. What’s left is a sincere but fundamentally useless ode to a madman, which does little more than invite us to gawk at the unspeakable. No fan could ask for a more faithful representation, but a true fan would understand, as Franco does not, that the true act of respect would be to leave it on the page. Also seen: The last few days are catch-up time as well. Like Noel, I thoroughly enjoyed Lukas Moodysson’s teen-punk anthem We Are The Best! ; like Scott, I was much impressed by Nicolas Cage’s atypically controlled work in Joe, which sees David Gordon Green make a welcome and mostly assured return to his roots. But I must dissent on Hayao Miyazaki’s The Wind Rises—animating a biopic doesn’t make it any less plodding, apart from the occasional dream sequence, and this account of a Japanese aeronautics expert ca. the 1930s spends too little time on the details of his work and too much time on a fabricated, Love Story-style romance. As a huge fan of Götz Spielmann’s Revanche, I had high hopes for his follow-up, October November; it proved a mild disappointment, alas, though it’s sure to resonate with any adult who’s recently lost a parent (as I strongly suspect Spielmann has). Tsai Ming-liang, however, came through with his Venice prizewinner Stray Dogs—I don’t love it with the intensity that Scott does, and find some of its celebrated long takes a tad grueling (a friend calculated that 27 minutes of the film, in total, consists of characters staring silently at a single mural), but it’s a powerful vision of surrealistic despair in which even the walls cry. More on the wistful side is Blind Dates, a nicely modulated (if slight) romantic roundelay by the up-and-coming Georgian director Levan Koguashvili. And, finally, get ready for Jude Law as Dom Hemingway, a volatile gangster who, in what might be the most sheer fun TIFF 2013 had to offer, wagers that he can open a state-of-the-art electronic safe in less than 10 minutes, even though he’s just been released from a 12-year prison stretch. If he loses, he loses the same vital part of his anatomy that was the focus of Kim Ki-duk’s Moebius (see Day Six). How that plays out I’ll let you discover on your own, when that film and most of the others we’ve reported on over the past nine days make their way into the larger world. Here’s hoping we’ve given you plenty to anticipate.